The Marlboro Man is featured on these Marlboro Wild West playing cards. Two decks. Both of the decks still have the original celophane wrap and have not been opened. original sleeve too. Very nice condition! 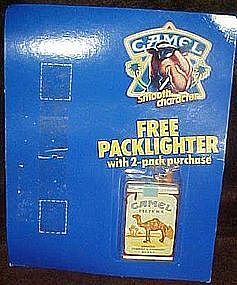 I believe these were a premium from Pall Mall cigarettes. 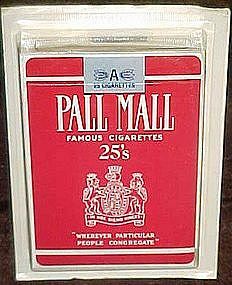 This deck looks just like a pack of Pall Mall 25's. 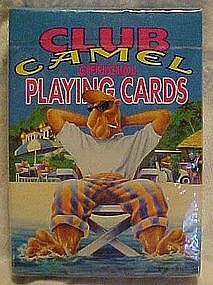 The deck is still sealed in the original plastic on the cardboard backing. 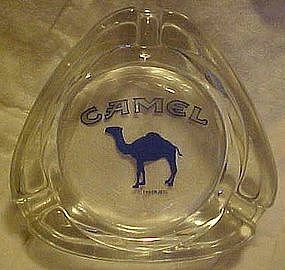 Nice Camel cigarette lighter with theembossed camel logo on the front. Made ofchrome. Nice condition, ad a nice spark! 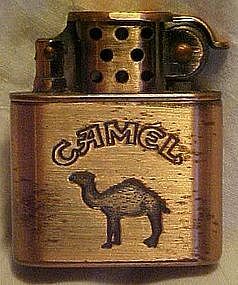 This is a nice advertising lighter for Camel cigarettes. Brushed copper finish. 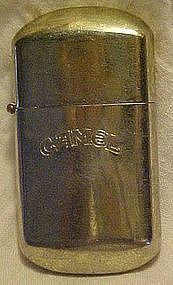 Lighter measures 1 5/8" x 2" Nice condition with no dents or scratches. Scratches you see are deliberate brushed marks to give the antiqued look.